Summer is just around the corner and we're accepting applications for 2019 Memberships! 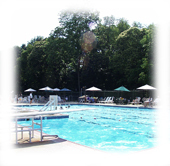 High Point Swim Club maintains a 175 family maximum in order to retain a "small pool atmosphere." We currently have no waiting list. - Sign up and swim the same day! What are you waiting for? High Point requires no bond payment. Instead, High Point requires a non-refundable $300 Initiation Fee, payable over the first 3 years of membership or you may elect one up front payment of $250 and save $50! A $100 annual maintenance fee is due with all membership renewals. Work a minimum of 5 hours during one of our clean up days and $50 of the fee will be refunded along with $60 in guest passes. The full $100 will be retained if families do not work the required 5 hours. - Please note: The maintance fee is waived the first year (for new members only). All outstanding balances are due postmarked by May 1, 2019. At High Point, Children under the age of 3 always swim free! Please download the 2019 New Membership Application Form and mail the completed form to High Point Swim Club, P.O. Box 7182, Wilmington, DE 19803, or you may submit your application to the lifeguards on duty at the pool. If you have any further questions regarding new memberships, or would like a one day family pass to check the pool out for yourself, please contact Beth Orndorff at 302-475-1180, or via e-mail at to_bg@yahoo.com.